IT’S OFFICIALLY SUMMER IN THE PHILIPPINES! It is the time of the year where families and friends plan for a getaway and take advantage of the school break. I asked fellow travel bloggers (both local and international) on which resort/hotel do they like the most in the Philippines and why. For the first part, I am presenting fifteen hotels & resorts from luxury to mid-range that will surely make your trip to Palawan (El Nido, Puerto Princesa, Roxas and Coron), Boracay, Cebu, Zambales, Baler, Bataan, Davao and Puerto Galera more memorable. Are you ready? 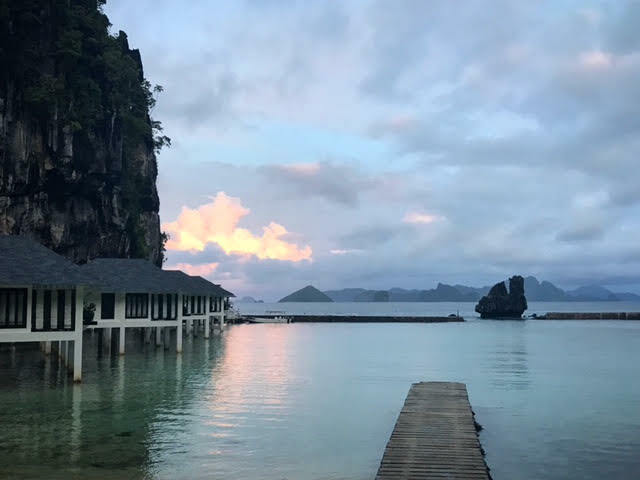 London-based luxury and lifestyle blogger Barbara Wagner of Jet-settera has nothing but nice words about Pangulasian Island in El Nido, which is dubbed as one of the luxurious resorts in Palawan. We all know that doing any of the island hopping tours of El Nido is worth trying, but why not splurge on a grand experience when you have the means to do so? El Nido Resorts Pangulasian Island is the most luxurious resort in El Nido, Palawan. It is an eco-resort on a private island that can only be reached by boat. This beautiful resort, was named one of the best beach front resorts in the World by Conde Nast. The hotel consists of private bungalows along the island. Arriving tourists are welcomed by a local band and served fresh fruit juice and a wet towels. The bungalows lie along the beach and is made of wood and furnished with wooden furniture. The bungalows are spacious and comfortable. The bathroom is almost as big as the room itself and the balconies are overlooking the sea. This paradise island resort is an ideal place for a honeymoon. Couples can have a candle-lit romantic dinner by the pool at night. The hotel also has a library made out of wood. Adventurous travellers should go snorkeling around the hotel to see the most colorful underwater life and some blacktip sharks. Read more about El Nido, Palawan at Jet-settera! Australian blogger Jeanette Cheney of Traveling Honeybird was more than happy to be ‘stranded’ in El Nido during her trip to the Philippines last year. For her, Lagen Island by El Nido Resorts is the best place to be in such situation! El Nido Resorts’ Lagen Island is the perfect get away for an adventure loving couple seeking a little bit more luxury and slightly less adventure. There’s stand up paddle boarding, kayaking, jungle treks and snorkelling to name just a few of the adventure activities on offer. Once you’ve spent the day being a mermaid you can relax by the pool, watch the monitor lizards wonder by and enjoy a cocktail or two as the sun sets across the sea. All in preparation for your evening spa treatment. So what else to do when you’re stranded in El Nido? Visit Traveling Honeybird to find out! Katherine Cortes of Tara Lets Anywhere can’t help but relax in Vista Tala Resort’s mountain view and infinity pool! There are far more luxurious resorts in the Philippines, but Vista Tala Resort stands out with its one-of-a-kind mountain views. This resort is built in a highly elevated location in Barangay Orani, Bataan, and faces Mount Natib. As such, the weather is usually foggy and cold. It’s an ideal getaway for a relaxing weekend, special occasions such as anniversaries and even team building activities. I enjoyed having a weekday break here in Vista Tala Resort. There are outdoor pools for those on a day tour, one which is an infinity pool perfect for photo-ops. 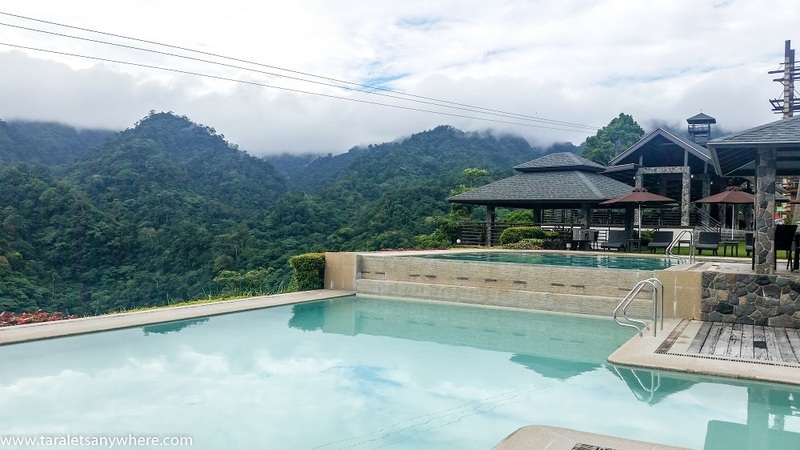 Feeling the cool air in my skin while lounging in the pool and gazing at the misty mountain tops is enough to soothe away the stress from the daily grind. The resort restaurant also has an alfresco dining area, which is just the spot for sipping hot chocolate or coffee while admiring the surrounding views. Another thing that I appreciate about Vista Tala Resort is that it’s good for both budget and luxury tourists. Day tour rate is less than P1000 each. For those looking for a more comfortable stay, there’s a range of accommodations available, including a villa with its own jacuzzi. Vista Tala Resort isn’t the grandest but as of this writing is one of the best resorts in the country for its unique location and mountain ambiance. Curious on what else is offered in Vista Tala Resort in Bataan? Tara na sa Tara Lets Anywhere! 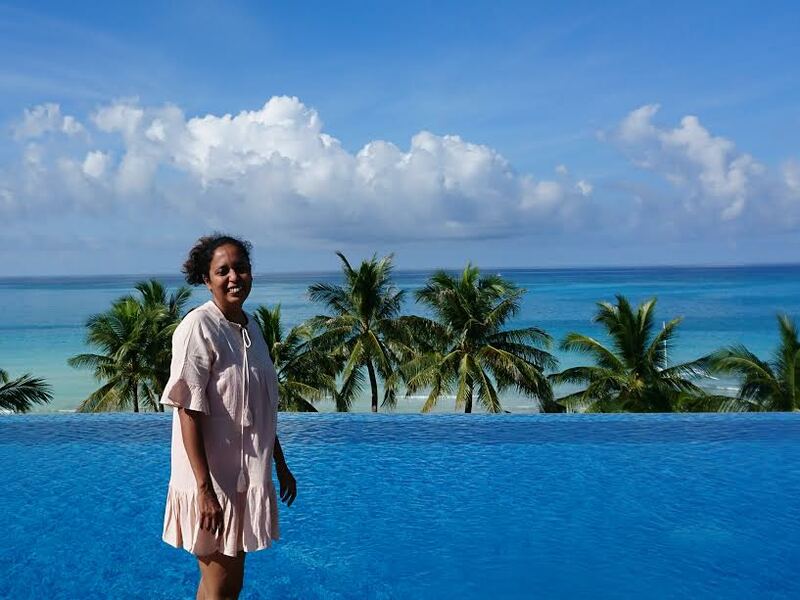 Mridula Dwivedi of Travel Tales in India can’t help but smile and be happy in The Lind Boracay! 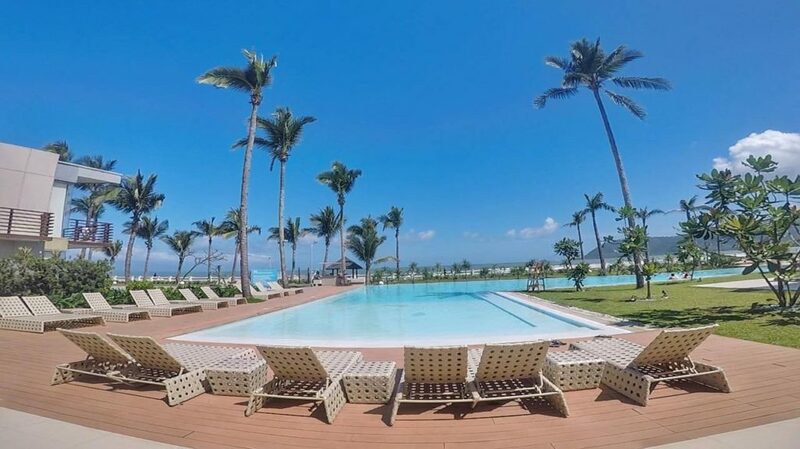 Mridula of Travel Tales From India has nothing but nice words to say about her stay in one of the newest resorts in Boracay, the party island of the Philippines. She also appreciates how the friendliness of the staff and how understanding the management are with the special needs of clients particularly with food. Why does The Lind Boracay stand out? White Beach as the name suggests is a stunning beach in Boracay and Lind is a cozy home away from home right by it! The resort is well spread out, and yet you do not feel lost, nor do you need transport to go from one area to the other. I like such places. My room was spacious, comfortable and it had a view of the swimming pool and the sea beyond! I loved to stand in the balcony at look out at the sea. Better still, I could go to the beach level and walk out to the beach itself! They have an infinity pool and another large pool suitable for families with kids! The path leading to the infinity pool has cool looking pods, perfect for soaking the sun and doing nothing. Being a vegetarian I am always a little jittery about the food in a foreign land! The Lind understands the requirements of a guest like me and they can do dishes that are tasty and vegetarian. They serve local cocktails at +36, you should give that a try. Crust is the beach café, for when you wish to grab something light with a beer! The Lind is a stylish resort with friendly staff. I would recommend it highly if you are looking for luxury that doesn’t overwhelms you! I found the place warm and cozy, a place I would like to go with friends or family! Search and read the full hotel review of Mridula about The Lind Boracay and get inspiration at Travel Tales from India! 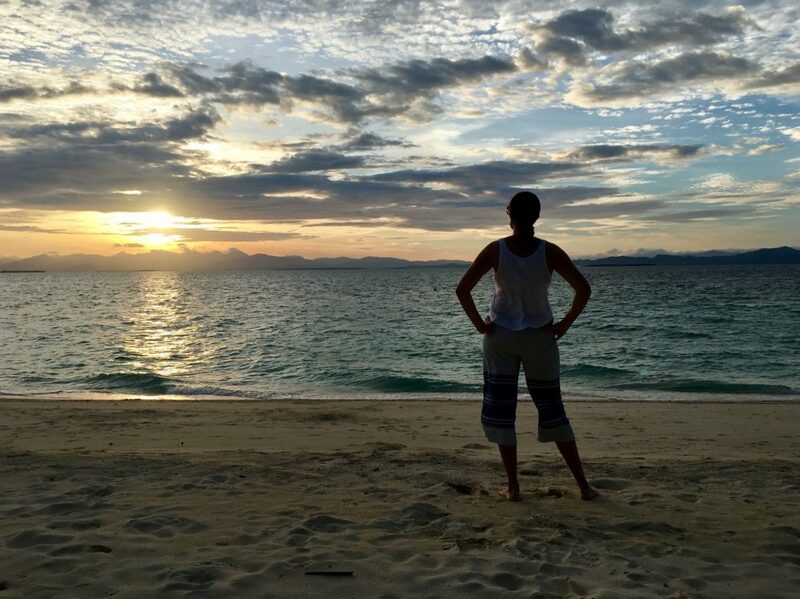 Live, Dream, Discover’s Sarah Hughes is having a great time in Astoria Palawan! Puerto Princesa is the main gateway to Palawan, which is undeniably the most beautiful province in the Philippines. It also houses some of the best resorts in the country and Canadian blogger Sarah Hughes of Live Dream Discover picks Astoria Palawan! Astoria Palawan is an eco-friendly resort situated right on beautiful Honda Bay, just a short drive from downtown Puerto Princesa. There are so many reasons why we loved this resort from the attention to environmental concerns to the spacious and comfortable rooms to the abundance of amenities. This resort really has it all! The design of the buildings is rustic-modern and everything was built with the areas’ natural features in mind, making sure to disturb as little of the original mango orchard as possible. They used green, sustainable building materials and methods and even built a pond to catch the nearby creek overflow to be used for irrigation and fishing. There are only 40 rooms at the 12.5 acre Astoria Palawan which is the perfect amount to provide the feeling of spaciousness and privacy for all the guests. Suites range from studios to one and two bedrooms and they are all beautifully decorated and have King or Queen size luxurious beds. They also have floor to ceiling glass doors for enjoying the beautiful view. Amenities at the resort are unrivaled with a gorgeous infinity pool, kayaks for going out on the bay, bikes for cycling the grounds, a full games center and even a high-end karaoke room. Plus the most recent addition of an awesome 4,000 square meter water park! Add to all of this a gourmet restaurant providing delicious local and International cuisine and you really will never want to leave the resort. Learn how to explore Palawan in 10 Days at Live, Dream, Discover! Pedro Richardson of Travel With Pedro in Pearl Farm Beach Resort – That smile you make when your expectations about a place is exceeded! UK-based Brazilian blogger Pedro Richardson of Travel With Pedro didn’t expect too much when he first flew to Davao City. It is not in the usual tourist radar of foreigners visiting the Philippines, but it seems that expecting less is better as he enjoyed his time in the capital of Mindanao! 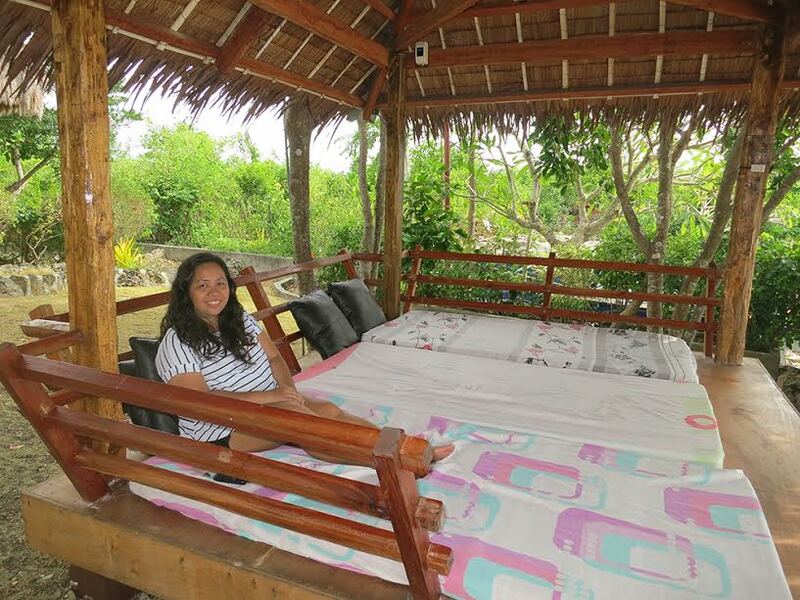 What makes his trip more rewarding is the fact that he stayed in Pearl Farm Beach Resort! One thing I was really looking forward to before my trip to the Philippines, was to enjoy a few of the many islands and beaches the country is so famous for. I had the chance to do it in a number of locations, but I wasn’t particularly expecting that in Davao. Only to find that on my last day, I was going to stay at a fantastic resort on nearby Samal Island. 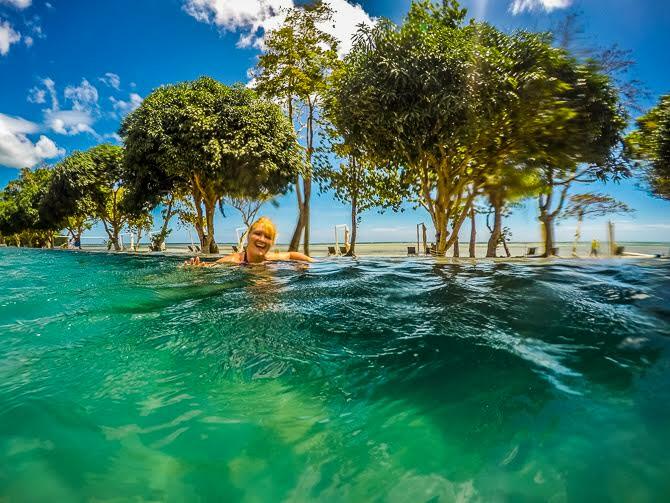 Pearl Farm Beach Resort, as the name tells us, is famous for the many corals and giant clams, only a few hundred metres from the resort itself. First things first, the resort itself was something of a dream retreat, with several bungalows by the water, equipped with the latest technology, but with some rustic touches to remind me I was in a little piece of paradise. My bungalow had one bedroom with a very comfortable bed, a large bathroom, fresh fruits, very fluffy towels. But despite everything being so nicely appointed, it’s the location that made me fall for it. What’s better than waking up, opening your balcony door to the crystal-clear water and having hundreds of corals and shoals of fish swimming right before your eyes? If you’re on your honeymoon, there are also larger and more private bungalows available with the same killer views and settings. In addition to a great location and beautiful bungalows, the resort has three restaurants and bars and, a very nice, large infinity swimming pool – and despite loving the beach and the snorkeling opportunities, I thought it would be a sin not to take a dip in that beautiful pool. Make sure to follow Pedro Richardson’s adventures at Travel With Pedro! Hale Manna Coastal Gardens, located at the southern part of Cebu, offers you a tranquil place that is ideal for relaxation. The resort resembles your typical home by the sea. Unlike other beach resorts in the area, Hale Manna, which stands for home with good energy, is more of a private vacation home. They practice sustainable coastal tourism and offers their visitors a unique experience on how one can enjoy an environment-friendly lifestyle in a tropical setting. When at Hale Manna, you will never run out of things to do. For beach enthusiasts, a short walk brings you to the famous White Beach of Moalboal where you can sunbathe. Those who love to swim will be rewarded with a view of the rich marine biodiversity in this side of the Philippines should they opt to go snorkelling or go scuba diving. Moalboal is home to one of the best diving sites in the country and a short boat ride will take you to Pescador Island, famous for its rich underwater life, sardine run and white tip sharks. If you’re lucky, a passing whale shark can be spotted too. There’s also a plane wreckage hidden north of the resort so scuba divers and freedivers can also include that in their must-see lists. For those who simply want to chill and relax, huts are spread out in the property where you can enjoy your afternoon catching up on your readings while waiting for the sunset, which is a sight to behold on this side of the archipelago. Read the detailed review of Hale Manna Beach Resort Moalboal via The Travelling Feet! Mabuhay! Or, as we say in English, To Life, or Live Great – and that’s exactly what a stay at the five-star Diamond Hotel Philippines provides. After eleven hours of flying, then getting through Manila’s congested morning traffic, I was ready for a few hours of relaxation before the scheduled start of the workshop I was conducting. So, being whisked away to an express check-in at the Diamond Club Lounge on the 25th floor was truly appreciated. My room had everything I could possibly need to get refreshed and head out. Although the temperature was already in the 80s outside, the air conditioning was working so well I had to turn it up. I would rather have crawled between the Egyptian cotton sheets and laid my head on the fluffy pillows, however, that had to wait. Hotel location is everything when I’m traveling, and the Diamond has it all. It’s near the Philippine International Convention Center where I was headed, as well as the Mall of Asia and other shopping centers. The American Embassy is just down the street, explaining the hotel’s security that I came to find comforting rather than intimidating. In addition to traditional doormen, security guards outside the hotel checked beneath vehicles, then put all luggage and packages through a scanner to ensure safety. And just in case technology missed something, the guards also had dogs checking things out. While a room with a view is nice, sometimes convenient location means the view is just another skyscraper. However, the Diamond is situated right off the avenue that runs along Manila Bay – sunsets over the water were pure gold through my 24th floor window. I took full advantage of the hotel’s Diamond Club Lounge, enjoying cocktail hour from 5:30 to 8 p.m. each night, as well as tasty hot breakfasts up to 10 a.m. in the morning. There’s never enough time in hotels like the Diamond, though, to truly enjoy everything, and I missed out on the Health Club sauna, steam bath, pool and outdoor jacuzzi. Next time! Check out some of Linda Aksomitis’ travelogues and support her works at Guide2Travel.ca! A stay in The District made Trisha’s Boracay trip a relaxing one! Trisha Velarmino of P.S. I’m On My Way may be known in the blogosphere these days as a long-term traveler who made Tel Aviv, Israel as her base, but this lady doesn’t forget her home country! A few years ago, she flew back home and one of the places she visited was Boracay, where she stayed in The District. In 2015, I came back home from traveling long-term and vowed to myself that I will travel my country more. The first island I wanted to go back to was Boracay and I had the opportunity to stay in one of the finest hotels in the island – The District. The hotel’s location is perfectly situated in the center and they have a beach front where I spent most of my afternoon reading books and sipping strawberry daiquiris. Ideally, the District is for couples and families but if you are traveling solo, it is a perfect paradise. They have a private pool inside and a state of the art gym that surely didn’t make me feel I was alone. There are so much stuff to do within the perimeters of the district! Breakfast is also amazing as it offers you the best view in the island. For dinners, they have a rooftop bar (and loads of alcohol choices) that is also stunning at night. Room rates won’t break the bank of Millennial Luxury Travelers. The only pitfall is that they are always full – you need to book your stay in advance! Need some inspiration for traveling long-term? Visit Trisha Velarmino’s blog P.S. I’m On My Way now! Under the sea… Under the sea… Have you been to the Reef Island? Shandos Cleaver of Travelnuity can’t help but gush over her snorkeling experience in Modessa Island! It is every sea lover’s dream come true! Who doesn’t dream of staying one day on a deserted island? Just you, a white sand beach, crystal clear water filled with colourful fish… As long as you also have a comfy bed, plenty to eat, preferably some ice-cold beer, and maybe some snorkelling gear! For me Modessa Island Resort made that dream into a reality. Situated on a small island about an hour’s boat ride from Roxas, Palawan, it’s not a flash resort, but a more rustic experience. It provides you with just enough to make your stay comfortable, at an affordable price. So there’s plenty of sun loungers and hammocks, but no hot water in the showers and limited hours of electricity. Not that you need a hot shower in the Philippine heat! In particular I recommend it for snorkelling and diving lovers, just like me. (There’s a dive shop on the island, where I also hired my snorkelling gear.) There’re excellent coral reefs all around, with plenty of colourful fish and some larger fish too, such as the shy reef sharks. I stayed three nights and spent much of the day in the water, for hours at a time. Alternatively, it’s also a great place to just laze on the beach. (Although you can still manage to share social media updates when the electricity is off, by climbing up the tower and connecting to 3G from the mainland.) And at the end of the day, cross your fingers that you’re treated to one of its beautiful sunsets, a San Miguel in hand. View more underwater photos and information about Modessa Island through Travelnuity. Love surfing? You must visit Zambales! If you are visiting the Philippines for some beach-y fun, why not upgrade your regular getaways with a surfing lessons and island hopping? 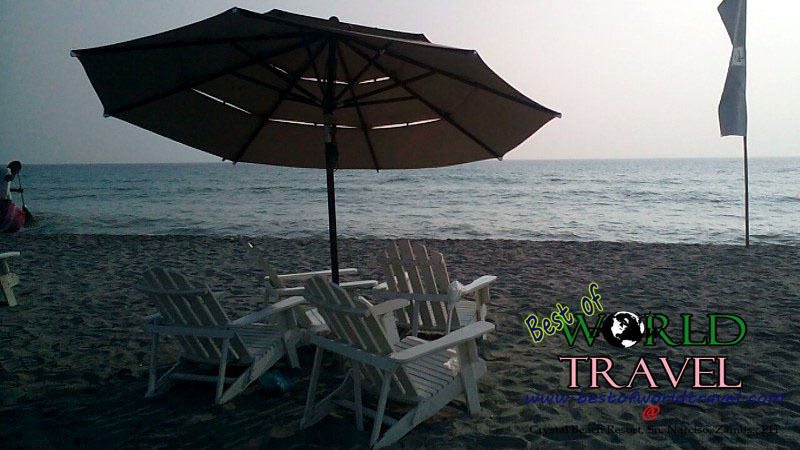 Crystal beach resort is an awesome surfing spot in Zambales, a north-western part of the Philippines. In this resort, you are to experience a considerable amount of strong and huge waves that can help you learn more about surfing. Of course, newbie surfers are all welcome to learn as the resort caters these kinds of services. On the other hand, if you only want to wear your precious beach wears, have a tan and experience the smooth and crystalline-white sands of a beautiful seashore, then Crystal beach can also cater your needs. They have fine white sands that will tickle your feet and toes. They have cheap hotel rooms and excellent services. The sea waters are very clear and clean. Plus, you’ll have an amazing nightlife there as they have activities that can involve all of the guests like dancing, drinking and bon fire. While it is a beautiful beach where you can learn how to surf, the ocean’s waves are mostly strong. Be careful when swimming especially with children as they can be washed out far from your reach. Because of this, I think a whole trip with your close friends will be enjoyed in this resort. Read the full review of Crystal Beach Resort Zambales at Best of World Travel! Who says doctors can’t relax and travel from time to time? Dr. Kris Eduardo of The Doctor is Out recently visited Baler in Aurora Province for a much deserved break from the medical field. Her stay in Costa Pacifica Resort (Awarded as a top choice of travelers in 2016 by Agoda) made the break more meaningful! Within the surfing spot of Sabang Beach stands the biggest and most beautiful resort in Baler to date- Costa Pacifica. Unmatched by competition, this resort offers the best in terms of facilities, food and logistical staff. It has several pools that are huge, clean and applicable for all ages with lifeguards on duty day and night. The resort also has in-house surfing instructors and surf shops, with prices competitive with local surf trainers on adjacent areas of the resort. Going around the city is a breeze with their free shuttle service. If you’re planning to see the best spots of Baler, Aurora its front desk connects you directly to the city tourism office for day tours. At the cost of luxury, everything you need in a surf resort is well-provided by Costa Pacifica. Whether you are riding the Pacific waves or having cocktails by the pool, a relaxing and memorable getaway is guaranteed at Costa Pacifica if you don’t mind the cost. TIP: If you have surfing plans during a stay in Costa Pacifica, it would be best to book a stay within best surfing season during the months of October to March. Either way, even during flat spells the resort itself is top-pick for a beach vacation. Thinking of visiting Baler soon? The doctor prescribes a Tricycle Tour of Baler to cure your travel needs! In addition to travel blogging, I’m a passionate fan of American football. For this reason, I often take selfies wearing a tank top representing my favorite team at the places I visit. 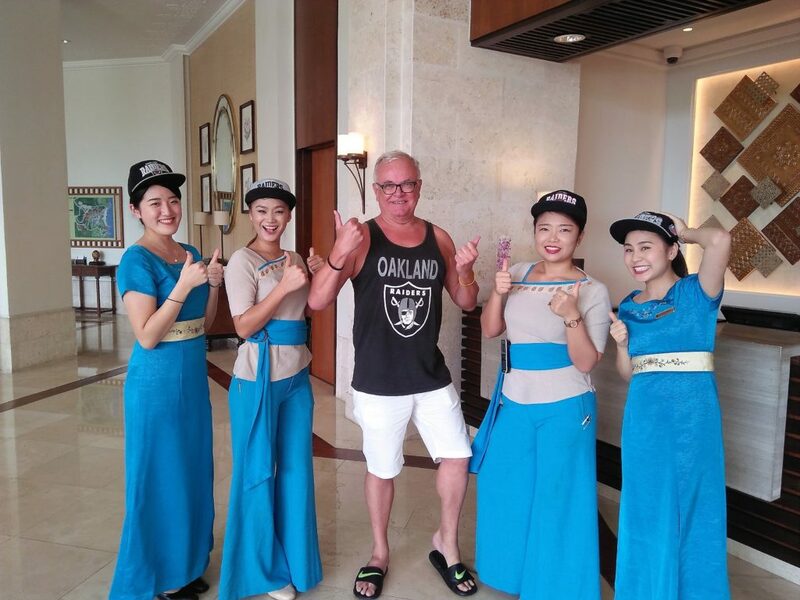 It has also become a tradition for me to ask hotel staff to pose with me. I wear my T-shirt and ask them to wear matching caps. Since American football is not very popular outside the United States, I usually have to explain what the tank top and caps represent. My team was scheduled to play during my stay, and I was planning to watch the game in my room. Before the game got underway, I wandered into the lobby with my stash of caps, looking for staff to pose with me. My first stop was the concierge desk. I explained what I wanted to do. The gentleman behind the counter excused himself and returned moments later with a couple of young ladies. To prove her point, the young lady started naming her favourite players as the concierge gathered additional staff willing to pose with me. I didn’t have to explain the significance of the caps. The young lady took care of that for me. Located in Lapu Lapu City, Cebu, Shangri-la’s Mactan Resort and Spa is a five-star resort with a 30-year pedigree. All 530 rooms have spacious balconies with garden and/or ocean views. The hotel has all of the facilities you would expect of a five-star tropical resort: spacious gardens, several food and beverage outlets, two swimming pools, a well-equipped gym, shops, an e-zone, tennis courts – the list goes on. There is a sea sports center and a dive center. There is a zipline and a jogging and exercise trail. There is a full schedule of activities each day. What sets this resort apart from the other resorts I’ve stayed at is the marine sanctuary that was established when the resort opened three decades ago. Thanks to on-going efforts to restore the coral reefs located off shore from the hotel’s private beach, the azure waters have been repopulated with tropical fish. The daily snorkeling safaris through the sanctuary were the highlight of my three day stay – next to meeting a fellow Raiders fan, of course! Thinking of splurging in Shangri-la Mactan soon? Read Michael’s review in Accidental Travel Writer! German luxury adventure traveler Tim Kroeger of Universal Traveller was truly impressed with his stay at Two Seasons Island Resort & Spa in Coron, Palawan. We all know that this side of Northern Palawan is a big hit to all types of travelers, but this island gave everything you could ask for! One of my most favourite Resorts in the Philippines is without doubt the “Two Seasons Island Resort & Spa”. It is located on a private island in Coron, Palawan. Already the way to the Resort is a highlight itself. After breakfast on the mainland I got picked up by a private speedboat that took me in 35 minutes to the island. The island and the resort is really a paradise and I felt home from the first moment on. I stayed in the Island Tip Bungalow which is located on the island tip of the private island and has a size of 36 square meters. The bungalow has one king size bed, a huge LCD TV, a fridge, AC and a fan. The bathroom is huge with a great mirror and an amazing rainforest shower. The highlight of the bungalow however is the private jacuzzi on the verandah from where you can watch the sunset and the beach. My favorite place! During your stay you can do all kind of activities like island hopping tours, you can rent transparent kayaks and Stand-Up Paddle Boards or do snorkelling and diving. When you are looking for some more action you can do Waterski or Wake boarding. I also enjoyed sunbathing at the beach and having a drink at the pool bar. I can also highly recommend the Spa treatments. I tried the Narra Spa Massage which takes 1.30 hours. It is a full body swedish massage with medium pressure to relax aching muscles and to stimulate circulation. Two Seasons Island Resort & Spa is a great resort especially for couples. The atmosphere is relaxed and calm, far away from the busy streets of the mainland. I really enjoyed my time there and can highly recommend the resort when you are looking for ultimate relaxation. Need more details? Read the full review of the newest luxury resort of Coron with photos at Universal Traveller! I am ending the first part of this collaboration with a resort of my choice – Buri Resort and Spa in Puerto Galera! Manila-based travelers often go to Puerto Galera as an alternative to Boracay. Aside from the fact that it is much convenient to get there for impromptu trips, they also offer what the night scene Boracay is famous for. For some though, they’d rather experience Puerto Galera in a much quaint and relaxing way. Buri Resort & Spa is the best alternative if you want to stay in a place away from the busy beach area and simply enjoy the facilities and company of your loved ones. Honestly, this is one of the best resorts I’ve been to in the Philippines due to its charm that reminds me of the old days (hello buri trees!). They also have a good in-house restaurant that specializes in Western and Filipino cuisine. 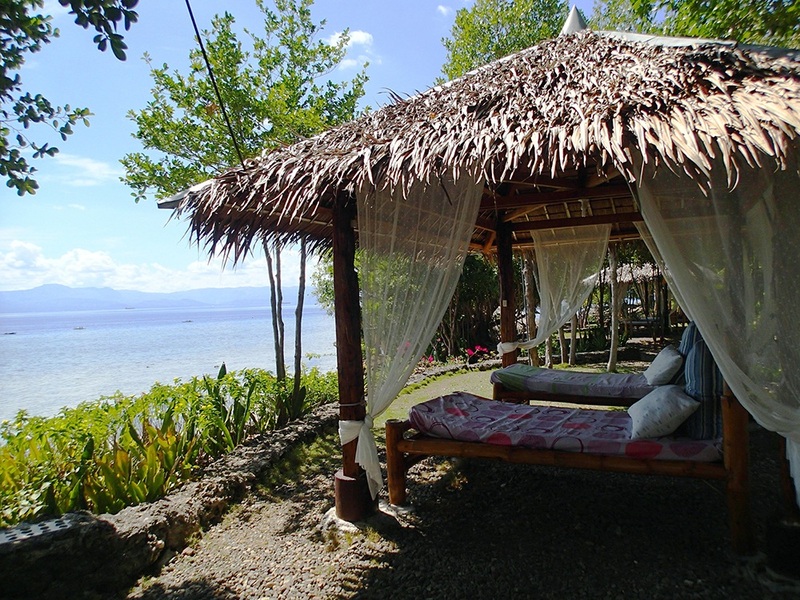 They also offer island hopping tours, a relaxing massage treat and they can also arrange intimate weddings and parties. I also love how spacious their family villas are, which is perfect for families and big groups. They also have villas with a private pool which will make any honeymooners swoon. 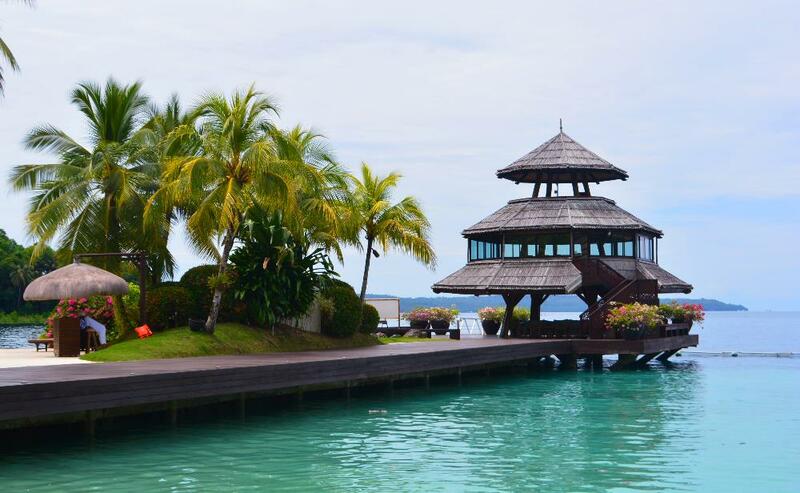 Want to escape Metro Manila or just curious about this quaint resort? Read my Buri Resort & Spa experience! Whew! It is truly fun in the Philippines! 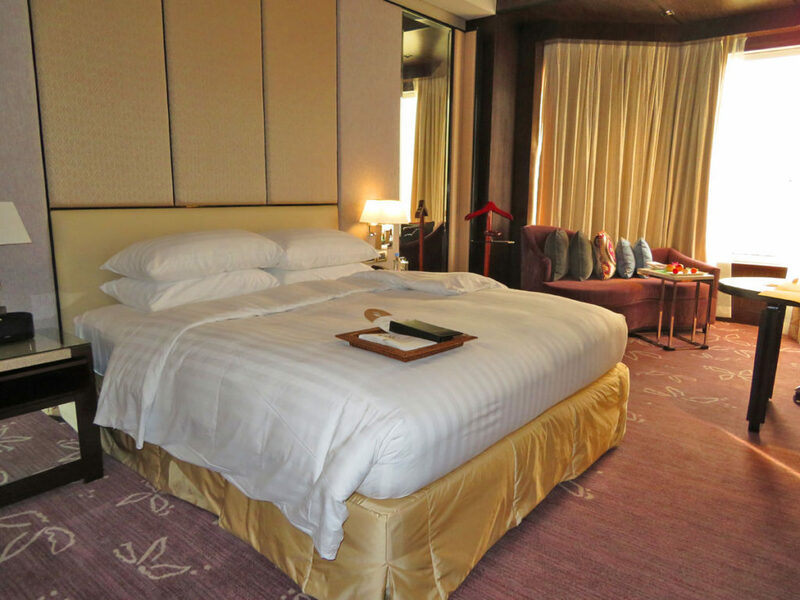 With the enticing sceneries, delicious food, grand hospitality and fun activities, a trip to the Pearl of the Orient is made more relaxing and exciting when you stay in a nice hotel or resort. Stay tuned for the second part of this series! Wow! What an ambitious undertaking, Mica! I’ve got a lot of reading ahead of me as I plan on reading all 30 reviews! Thanks for including my pick, Mica! Can’t wait to go back to the Philippines!